Guest post by Viv Forbes. Germany’s wind and solar power generation came to a standstill in late 2013. More than 23,000 wind turbines ran out of wind and most of the one million photovoltaic systems ran out of sunlight. For a whole week, coal nuclear and gas-powered plants generated an estimated 95 percent of Germany’s electricity. Britain has 3,500 wind turbines, but during a period of extreme cold they produced just 1.8% of UK’s electricity. But, gluttons for punishment, politicians intend building more. When electricity demand peaked at the height of the recent heatwave in Southern Australia, the total power output from the fleet of wind farms across Victoria and South Australia was almost zero. Solar panels worked at their peak for a short time during the heat of the afternoon, but waned as the sun moved on and smokiness increased. At dinner time on any still, cold winter night, when all suburban stoves, lights, TV’s and heaters need power, solar panels sit in the dark, powerless. And the idle wind turbines are probably drawing power from the grid for heating, lubrication, electro-magnets, hydraulics and start-up. Despite the expenditure of trillions of dollars on conferences, green energy subsidies, research, carbon taxes, carbon trading, solar and wind subsidies, plant construction, additional transmission lines and back-up power, wind and solar only produce a derisory share of world energy (“zero” to the nearest whole number). We keep hearing how “research” will solve the key green energy problems, but no amount of research can alter the fact that solar energy will always be variable, intermittent and dilute. Even if solar panels collected 100% of the solar energy that fell on them, and no dust or snow ever covered the panels, the output is always variable and intermittent, with the rise and fall of the sun, the long night and the variable clouds, snow and dust. Similarly the wind is variable, often too weak, sometimes too strong, and even when it is just right, there may be no demand for that surge of power. Germany has 23,000 wind turbines – they produce an average of about 17% of their installed capacity; on some days, they harvest nothing except subsidies (and they are good at that). And crucially, both wind and solar energy are very dilute, so large areas of land are required to collect significant energy and to build the spider-web of roads and transmission lines required to connect to each other and to the grid. Solar panels rob green plants underneath of their sunlight. Wind turbines annoy neighbours with their noise, devalue their properties and slice up eagles, bats and migrating birds. These are very significant human and environmental costs never mentioned by green energy disciples and promoters. No amount of research can change the key intermittent and dilute nature of green energy. We should stop wasting ever-increasing amounts of money on pointless research. Even if we invented magic batteries (small with massive capacity, low cost, no energy losses and everlasting life), the green energy plants would still need to spend over 60% of the energy they generate to charge the batteries in order to produce 24/7 power. There are places when green energy is appropriate and useful, and people should be free to use it at their own expense. But for grid power, it is not fit-for-purpose. All of this explains why Green Germany is now using more coal than it did in 2009 and its power supply is more expensive and less reliable. Viv Forbes is the Chairman of the Carbon Sense Coalition. He is a geologist, mineral economist, “political gadfly”, part time company director and full time sheep and cattle breeder. He has a Bachelor Degree in Applied Science (Geology). Uh Oh! Don’t look now, but Germany is building NEW coal-fired power plants. Yes, you read that right… the leader in solar, wind and “renewable energy” is going back to coal to replace it’s fleet of ZERO CARBON nuclear power plants. Of course, the left will spin this as a good thing. So with this new alternative arithmetic, a coal-fired power plant is better then a zero-emission nuclear power plant? The benefits of nuclear energy are often taken for granted―until they begin to disappear. In several countries, the closing of one or more nuclear power plants has affected the reliability and price of electricity, greenhouse gas emissions and the economy. And of course in the USA, there’s a war on coal AND nuclear power, with the federal government, through EPA regulations, forcing the closure of both. One effect of the persistently cold winter of 2013-2014 is showing up on the world’s largest group of freshwater lakes. According to an analysis by NOAA’s Great Lakes Environmental Research Laboratory, ice covered 78.7 percent of the Great Lakes on February 6. Not since early 1996 has ice been so widespread on the Great Lakes. This is an abrupt turn around from the past four winters, during which the peak ice coverage remained around 40 percent or less. As you can see in the graph below, the 40-year average is just over 51 percent. A Russian expedition ship carrying global warming scientists got stuck in ice earlier this week. Now a Chinese ice breaker sent to rescue the scientists is frozen too just miles away. South Pole weather has stymied a rescue by a Chinese icebreaker trying to reach an expedition vessel trapped for the past four days in frozen seas, a ship officer told CNN Friday. The Chinese icebreaker Xue Long, or Snow Dragon, was just six nautical miles away from the rescue, but now it’s stuck in an Antarctica ice floe, too. The Chinese crew is hoping a French icebreaker 14 nautical miles away will arrive and offer relief, said Zhu Li, chief officer of the Chinese ship. But it’s likely the French vessel Astrolabe will also be slowed by the polar cap’s extreme frigidity, Zhu said. Those two icebreakers — plus a third, from Australia — were battling the planet’s coldest environment in trying to reach the stranded Russian ship MV Akademik Shokalskiy, whose 74 researchers, crew and tourists remained in good condition despite being at a frozen standstill since Monday. It all shows that some lands — especially the ends of the Earth — will never be tamed. The Snow Dragon is in near-constant communication with the Russian exploration vessel and has ample supplies of water, food and medicine — even a helicopter — if the ice-bound Shokalskiy needed them, Zhu said. …The expedition is trying to update scientific measurements taken by an Australian expedition led by Douglas Mawson that set out in 1911. The expedition to gauge the effects of climate change on the region began November 27. The second, and current leg of the trip, started December 8 and was scheduled to conclude with a return to New Zealand on January 4. ‘Save the Trees — Use More Wood’ – May 1, 2002 — Greenpeace co-founder and Ecologist Dr. Patrick Moore stated in 2002: Save the Trees, Use More Wood: Excerpt: “We should be growing more trees and using more wood,” explained Moore. “The less wood we use, the more steel and concrete we use. […] Moore explained that a greater demand for wood products leads to more forested land, noting that 80 percent of the timber produced in the U.S. comes from private property. He predicted that if “those land owners had no market for wood, they would clear the forest away and grow something else they could make money from instead.” “When you go into a lumber yard, you are given the impression that by buying wood you are causing the forest to be lost, when in fact what you are doing is sending a signal into the market to plant more trees,” Moore added. The recent release of the Berkeley Earth Surface Temperature (BEST) study, which showed a worldwide temperature increase of about 1°C since 1950, was heralded by many as proof of global warming. Some skeptics, however, noted that the BEST data also showed that temperatures had remained unchanged for the past decade, suggesting that any warming trend had ended around the turn of the century. From a historical perspective, the upcoming major Northeast winter storm could prove to be unprecedented in terms of its early arrival in the season and the amount of snow it will drop. 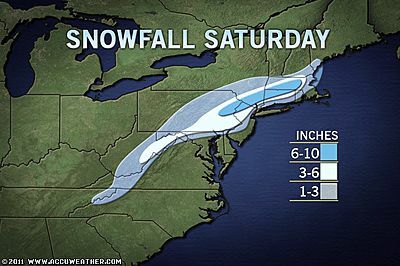 AccuWeather.com meteorologists are now confident that several inches to a foot of heavy, wet, and in some cases damaging, snow will fall over parts of the Mid-Atlantic and New England on Saturday. Expert Senior Meteorologist Alex Sosnowski has specifics on the forecast for the upcoming storm. The notion of a pre-Halloween snowstorm has our meteorologists and climatologists scrambling to put the storm into some sort of perspective as to how many records could be busted by this snowstorm.